IPv4 address exhaustion is slowly going into final phase. To use IPv6 addresses in legacy software, some mechanism must be in place to not confuse programs with colons (:) in the addresses. 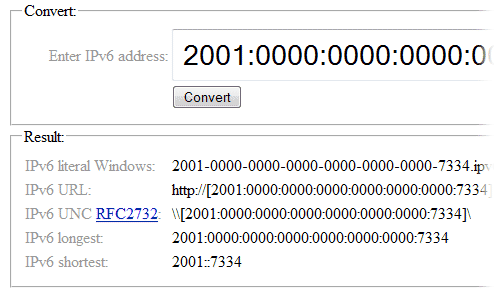 For Windows this is IPv6 literals. Also, zone ID is supported and shortest / longest IPv6 address form is calculated. For more information and to test this tool in action, click here! Use form below, if you have suggestions or comments. UPDATE Apr 26, 2011. As Takyoji suggested, just added support for Reverse DNS lookup. Now last row is calculated for use with the special domain ip6.arpa. Could have it also output the reverse DNS form of IPv6 addresses (which takes forever to do by hand), which is a necessity for rDNS for mailservers. Would REALLY help as there’s really no quick calculator/generator that can be found from a simple Google search result. Is there a reason a DNS lookup for a literal does not return a AAAA record containing the corresponding IPv6 address? This why no special translation would be needed on a system that supports DNS but is not aware of IPv6 literals. For example a DNS lookup for the name 2001-0db8-85a3-0000-0000-8a2e-0370-7334.ipv6-literal.net would give a AAAA record for the address 2001:0db8:85a3:0000:0000:8a2e:0370:7334. May be because it is not supposed to. WishMesh, Proudly powered by WordPress.